Pace Groucho Marx, I never thought I'd join a book club that would have me as a member. Yet when the good people of the newly established community hack space, MADLAB, suggested an SF book club, I was straight there. I've gone back to reading SF over the last few years, and whether its literary authors take on the future (such as "The Road" or "The Book of Dave") or the best of the new speculative fiction writers (China Mieville) its clear that now's a good time to be interested in SF. 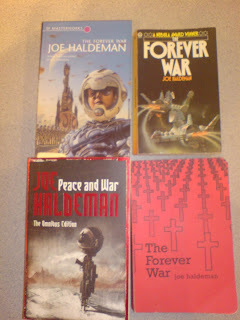 In the cold of early January I joined a dozen or so others to map out the first reading list - and, a month later - nearly double that number had arrived to discuss the first choice, Joe Haldeman's "The Forever War." An acknowledged SF classic from 1974, it was an inspired first choice. Firstly, it's a book I'd not been aware of, so it was good to read something new, and secondly as avowedly a book of big themes it was a great one to start a discussion amongst a group of strangers. Our advocate for the book, Tom, let the group do the talking, priming us with a few key questions about what we thought about the book. The novel tells the story of an elite soldier, William Mandella, who is amongst the first soldiers to fight an alien race, of which very little is known. As humanity goes into far space to battle with this unknown enemy, the parallels with Earthly battles, particularly the Vietnam war, which Haldeman had fought in, and which was so contemporary when the book came out, are clear. An SF book that is as much military adventure as space opera, Mandella is seen through his training (very reminiscent of the scenes at the start of Starship Troopers, or even Full Metal Jacket), before going into space and having the first encounters with an alien they know nothing about. What makes the novel so compelling is that each time he returns to earth - or earth's colonies - he is just a few months or years older, but the human race has changed irrevocably. The people he once knew as a youngster have grown old and died when he first returns, and each further visit, sees the whole society has changed. Earth in his absence has become a war economy. There was a lot of discussion about those initial training scenes - some people felt that they were a little slow and hard to get through, and its certainly true that the pace of the book speeds up as you get further through it. As you can see from the book covers above, people had different versions of the book, and had first encountered at different times. It was really interesting to hear Dave's experience of going back to a book he'd first read in the early seventies after it had first come out. On the one hand there's a certain dated-ness to the novel, but on the other hand it's themes had stood up well. Dave made the key point that the technology in the book is "pre-digital" - so that there's much visioning of future technology as being physical and mechanical. For Mandella the soldier, the discomforts of space are very clear, but the imagined future almost has a "steam punk" element to it, with large hulking battle suits. Even medical technology is seen viscerally, as about replacing limbs in a very physical way. It will be fascinating when we look at William Gibson's "Neuromancer" to compare with the book that really imagined a "digital" rather than "mechanical" future. Amongst a large group there were a number of differing viewpoints, of course, but most people enjoyed the choice - and found the character of Mandella compelling. There was probably less consensus on the earth scenes, though Haldeman's imagination and consistency here was praised. Away in space for so long, Mandella's accumulated wealth makes him rich when returning to earth of it's satellites. Yet the world he has returned to is so changed that he almost can't wait to return to action. Promoted through the ranks as he survives each trip, he is uncomfortable with his new rank, and there's a generation gap between him and the younger soldiers. Our group had some reservations about Haldeman's sexual politics - the soldiers are forced to sleep with a different woman every night during the first scenes - yet later in the book, heterosexuality has become an incomprehensible perversion. To me it did seem to fit a little with the concerns of the time in which it was written. Oddly, as someone pointed out, it hardly mentions race - except to note that over time humankind has become a generic pan-asian type - yet concentrates on sexuality. The love story that comes into play as the book progresses was also praised. Though I felt the other characters were a little thinly drawn, it certainly adds a human element to the tale. 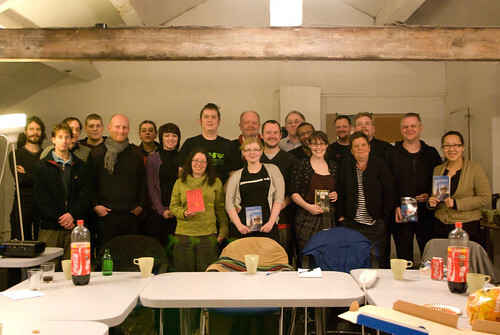 It was a wide ranging meeting - and it was good to hear a range of views, from SF obsessives to SF newbies. In a convivial atmosphere, a pile of Pizzas arrived to form a natural break in the discussion, and inevitably a group of us ended across the road at Common. The next book is J.G. Ballard's "The Drowned World" but we're also asked to read Clifford Simak's short story "Skirmish" from our "course anthology", the Penguin SF Omnibus. P.S. Just remembered a couple of other things... apparently the book is going to be made into a 3D film by Ridley Scott (cue much dissing of Avatar, particularly by the poor guy who's a projectionist at the IMAX and had seen it a zillion times!) 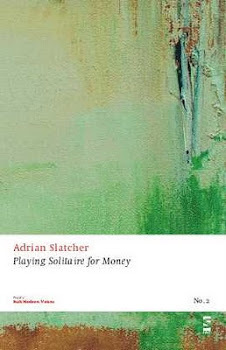 - and Manchester Libraries has ordered copies of the next 3 books that will be able to be borrowed from the Madlab itself. It was probably as far back as 1974 the first time I read this book and I’ve gone back to it since. Like all great tales it spins on a very simple idea. Other writers have dealt with the future evolution of mankind but how to get your ‘Buck Rogers’ character there to comment on it is the trick. The Time Machine was the most perfect solution to the problem and in some respects it’s a shame that Wells wrapped everything up in a single volume; he could have had his hero stop off during several periods like Sam Beckett in Quantum Leap only looking forward and not back. Haldeman’s solution was brilliant. There is a sort-of-sequel called Forever Peace which picked up three awards when it came out in 1998 but I’ve been wary of checking it out. The sequels were mentioned by our advocate - and someone had the omnibus - its such a perfectly rounded idea in the first book, that I don't think they'd add much from what people said. I had read the book and enjoyed it immensely, but didn't notice I was going to be in Holland during the actual book club meeting... ! And I can't make the next one either. Still, sounds as though it went well. I'll get there eventually, hopefully in time for Neuromancer which I am looking forward to. I'm probably going to miss the next one as well, Kate, but will read the book anyway! I reality i've only seen the Fox logo and the credits a zillion times. The rest of the time spent in the booth is oncerned with finding distractions from the mind-numbing boredem of having nothing to do for the period of two hours and forty-six minutes whilst the film is running. Thankfully this leaves me plenty of time to read.